This is a Premium 2 Bedroom 2 Bath Unit located in Villas of Clearwater Beach with a view of Gulf of Mexico and Clearwater Beach. Class and elegance in a 2 bedroom/2 bath condominium unit. Rich dark woods and dynamic use of colors throughout. Granite counters in the kitchen and baths, fully equipped kitchen. Spectacular views of Clearwater Beach from north to south with the waves of the Gulf of Mexico lapping at the sand. This unit comes with a Reserved Parking Space. New flooring, remodeled kitchens and bathrooms with brand new appliances, new 60” HD flat screen TVs in the living room with added HD channels, and new windows and doors which reduces exterior noise. 20% OFF on any new reservation booked for 5 or more nights between April 6th and May 25th, 2019. View Our LIVE Beach Cam! 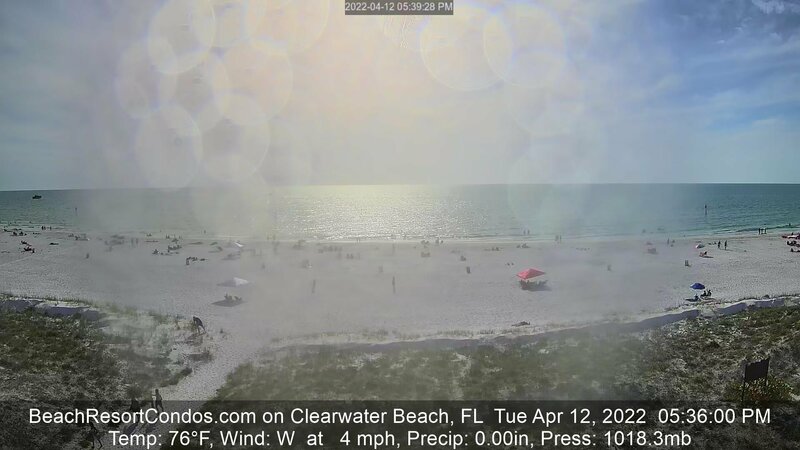 Check out our Clearwater Beach LIVE Streaming Web Cam located on one of our Surfside Condo units! For the first week in December the weather was very good. 6 out of 7 days were good. This is a great location. Loved that it was right on the beach. The unit was clean, attractively decorated, and thoughtfully furnished with plenty of bath, kitchen and beach items. Everything was very clean. Having the condo right on the beach made our vacation a joy. I liked it that the condo was on a quieter section of Clearwater Beach. Sunny days for the entire week we were here in October. No improvements needed. This is just a great place for a beach stay. I hope to return soon. We really enjoy these units. We enjoy the location. Our favorite area. We thank Anna for helping with our concerns about the hurricane and the red tide. Villas A7 is our favorite; it's where we stay every year when we return to CWB. The unit is beautifully decorated, well furnished, comfortable, quiet and relaxing. Views are fantastic! Exceptionally clean; thank you. Great location for what we like to do. Easy walk to the Palm Pavilion and Frenchy's Rockaway, two favorites. Easy drive to Pier 60 and the marina. Covered, reserve parking is wonderful. The draw to CWB is strong; we've been coming since 1954! We love the beach and surrounding town. Visits are more like a homecoming than vacation. We have many friends living and working in the Tampa Bay area. Typical weather for late August: beautiful days with a late afternoon pop up thunderstorm. You wonderful folks see to our every need and we appreciate the hospitality. Thanks for another great stay on CWB. We'll see you again next year! Loved it... Close to everything. Did not need our vehicle to travel to the pier, shops or restaurants. Beach was very clean. The ocean and sunsets were beautiful. Overall we had a wonderful stay here at the condo in Clearwater. We would love to one day come back and stay here. Unit was great. Lots of room. Great views of the Gulf & Beach. Building is quiet. All of the guests are courteous and having a fun relaxing time!! Unit was clean. Unit is close proximity to many restaurants and can't beat the ease to get to the beach. Just steps away. Pool is great after a long day at the beach. Beach is super clean. Not crowded. ClearSky Cafe, Palm Pavilion and Frenchy's are great restaurants near the condo. Beachcomber Restaurant never disappoints. Awesome June Weather! We will be back. Beautiful updated unit right on the beach. Immaculate!! We walked everywhere. Such a great location. Love the area. Safe and well kept. We had 7 weeks of perfect weather. We were very pleased with everything. Overall beautiful room and view, would love to stay again and I would recommend to anyone. By far the most beautiful beach in Florida, we visit every year and will be coming back next year and staying with B&W management... it was amazing, by far the best condo I have stayed in, my family enjoyed everyday of it. Thank you. Unit was great. Lots of room. Great views of the Gulf & Beach. Building is quiet. All of the guests are courteous and having a fun relaxing time! Unit is close proximity to many restaurants and can't beat the ease to get to the beach. Just steps away. Pool is great after a long day at the beach. Unit was great! We will be back. Only way it could better is if the we could check in earlier than 4pm! We can't wait to get back! Great condo, gorgeous view of the sea. Comfortable and safe. A7 was very clean upon our arrival. This unit or shall I say this building is close to everything...restaurants, shopping and of course the sea. Love Clearwater Beach....we have been coming here for years. Our favourite place. Any concerns we had were immediately looked after. Customer service is top notch. Meeting Wendy and Bobby was the highlight. They are gracious, customer service oriented individuals and we feel we have made new friends. A big heartfelt thank you. Fabulous view of the Gulf, spacious balcony with comfortable seating and table choices. Lovely decor, spacious and pristine. Pots and Pans, dishes, silverware, utensils all in mint condition. Comfortable beds, bedding and plenty of towels. Very Clean. Needed a sponge and extra kitchen towels which were immediately supplied by B&W. Superb washer and dryer - very new and top of the line. Detergent and dryer sheets supplied. Grounds also kept clean and inviting. Pool was clean and a perfect temperature. Bathroom by the pool also very clean. Lovely area, just enough to do on the island and close enough to St Petes to engage in cultural and city activities if we chose. Beach itself is endless with fine white sand that is maintained each night. Thank you for such a wonderful condo! My family had a wonderful vacation! Clearwater Beach is so beautiful and so is the condo! Amazing view and lovely condo! The kids loved the pool and the beach. The sunsets were amazing. Really recommend Sea Screamers to see the dolphins. 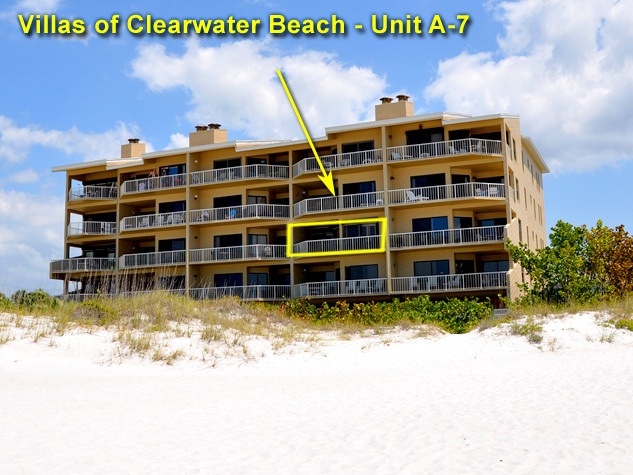 Really close to the beach, convenient location, cool balcony, great facilities, well kept up, + great place to explore Clearwater!! Our stay was great! Like a home away from home. With everything you need for the beach. The info booklet was helpful. Umbrella, chairs, towels, toys, cooler, all an added bonus. Good wifi too! I would give this condo an excellent rating over and over again. This will be our second year staying in this condo. We will definitely be back every year. It is within walking distance to shops, Walgreens and restaurants. Once we get there the car stays parked all week. Absolutely beautiful and clean! Everything was perfect. We look forward to staying with you again in a couple weeks! We can't wait to book our vacation next year! Just beautiful! Spacious and had everything we needed. Spotless! Walk to the beach, store and restautants. Our favorite beach! The condo was so clean and beautifully decorated, it had everything we needed for our family vacation. The view from the balcony is breathtaking. We will definitely be back and would recommend staying here to family and friends. What a marvelous condo! Exceptionally clean, tastefully decorated with modern furniture and up-to-date appliances. Tiled floors in common area and hardwood in bedrooms. I highly recommend this unit. We were blown away by the interior of our unit. The d�cor & finishings were great! We especially loved the master suite. As a side note, we noticed a man working hard each day to keep the pool and grounds beautiful. Much appreciated! This unit was excellent! In great condition, with very tasteful decoration and much attention to detail. The location and view were also great. Everything was very clean, the unit is very spacious and comfortable. Thank you! The unit was wonderful as was the complex. Very much enjoyed our stay, we will be back. Thank you! All Content and Design Copyright © 2007-2019 B&W Management Inc.